This marks the seventh year for what has become one of the most highly regarded events on the west coast summer music festival circuit. 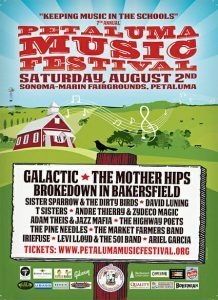 The Petaluma Music Festival takes place on Saturday, August 2nd, 2014, at the Sonoma-Marin Fairgrounds & Event Center in Petaluma. With past festival performances by national acts like Trombone Shorty, The Devil Makes Three, Jackie Greene, Xavier Rudd, and ALO, festival goers are always treated to a family-friendly event with a unique variety of indie-band music for people of all ages. This year is no exception. Performing at the 2014 Petaluma Music Festival are New Orleans funk and jazz jam band Galactic, the California rock and soul of The Mother Hips, the country and western sounds of Brokedown in Bakersfield featuring Nicki Bluhm, the Brooklyn funk and soul of Sister Sparrow & The Dirty Birds, the Americana folk of local singer-songwriter David Luning, the sweet three part sibling harmony of the T Sisters, the hip hop, jazz, and electronica of Adam Theis & Jazz Mafia, and the Louisiana sounds of Andre Thierry & Zydeco Magic. Joining these headliners are Bay Area favorites The Highway Poets, Levi Lloyd & The 501 Band, IrieFuse, The Pine Needles, Ariel Garcia, and The Market Farmers Band. Rounding out the day are a silent auction, a celebrity autographed guitar raffle, a kids area, free drinking water, and a variety of specialty food, craft, and merchandise vendors. The presenting community partner is the Lagunitas Brewing Company. The Petaluma Music Festival is a 501(c)3 non-profit organization dedicated to “keeping music in the schools.” All festival proceeds benefit the music education programs in all Petaluma area public schools. In the last four years, the Petaluma Music Festival has donated nearly $100,000 to keeping music in the schools, and we are looking to increase that number in 2014. Tickets are $40 General Admission, $85 VIP Premium (includes shaded reserved seating with complimentary wine, beer, and light appetizers), and children 12 and under are free with a paying adult. Ticket prices will increase on the day of festival. Students 13-17 can purchase $20 tickets at the door. Tickets are available for purchase online at www.petalumamusicfestival.org and in person at McNear’s Restaurant in Petaluma, the Lagunitas TapRoom & Beer Sanctuary in Petaluma, People’s Music in Sebastopol, and the Last Record Store in Santa Rosa. Gates open and music begins at 12:00 PM and the festival concludes at 9:00 PM. The festival location is the Sonoma-Marin Fairgrounds, 175 Fairgrounds Drive, Petaluma, CA 94952.